No hands on movement or genetic manipulation of the animal or it’s ancestors. So if you had a 5k ranch, trapped 20 doe and a buck, put them in a pen, turned them and their offspring out 10 months later, which deer would be not native? That is a really handsome looking deer along with the horns...neat looking. Thanks for sharing...the vid was outstanding. Awesome buck Marko! Amazing what kind of animals great genetics and management can produce. It’s really special when you can get it done without taking shortcuts. Cant see the logic in that thought, none the less he's an awesome deer, best of luck with him, Merry Christmas. At what point does that herd become something other than all the other herds around it that haven’t done that? That’s the entire point of DMP... to manually change the herd genetically... how can you change it like that and have it still be native? Last edited by Encinal; 12-22-2017 at 05:51 PM. Agree with this statement 100%. So if they are not native, what are they? Everything is native to something, what are these offspring, certainly not introduced, they are born of parents that are native, they were born on your place, they can be nothing but native. Where’s a house cat native to? I rather you just answer my question, but I doubt you will, look up the definition on native, before replying. On second thought don't bother, I got a plate af fried shrimp and a bottle of Weller 12 waiting in me, I'm out. I guess you could call them native to your DMP pen. How is culling bucks not deciding who gets to breed? If hes dead he can't breed. 4000 acres isn't a pen, buts possible to influence the genetics through culling. Beautiful buck Encinal! Thank you for sharing! Can’t wait to see what he does next year. Awesome Deer Marko. He's a True Special South Texas Giant. That is incredible. I may have missed it, but are you considering taking him now or letting him walk again? Think we are letting him ride minus some unforeseen event. I look forward to this same conversation next year. Didn't you ask the question of wether to shoot or not last year? We all knew the answer and what you were going to do. Terrific buck. Look forward to the updates next year. I’ve never had a conundrum like that. When our first big big deer were 5 we never really thought about it because letting them live was just what we were supposed to do... now that I know how many deer die... as pretty as he was last year... it was an actual question. So was this year... but this year... after last year... wasn’t as big a question since we are one more year down. You have got a lot to choose from...walk him. Great Deer Marko. He is definitely some thing special and unique. Look forward to seeing how he looks n st year. That's exactly what I said to myself when I was watching that drone video. Any updates on this beast!?! Dang, he looks great this year. Low fence Medina county its hammer time. Life is too short to pass up deer like that. Who cares if he adds 10 inches. We could all die tomorrow. Looks like you guys got him tonight? Looking forward to the score and the story. I figured he would hit the dirt as soon as the season got underway. When that didnt happen, I assumed he was getting another year. Congrats to everyone involved. As I said on the post, sad to see him down but man what a buck. Let us know once y’all finish measuring him up. Thanks guys he was a special buck for sure. So the time had come to cash in the chips. He was a tremendous deer and I'm sure you guys will miss seeing him but as you have said before they have a short shelf life. Congrats on a raising such a stunning animal, hopefully he passed on some of his genes. Well done. The king is dead long live the king. Need a new avatar. What a beautiful specimen. Puro Tejano. I dont have IG. 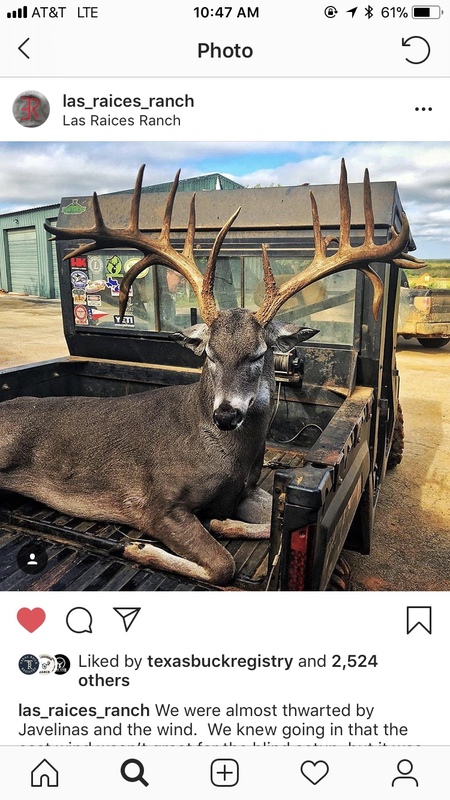 Any pics of the buck from this year? I'm thinking he will go 220".